Don’t believe in ghosts? These pictures and the terrifying stories behind them might change your mind. Do ghosts exist? In an age of photo manipulation, a tradition that can be traced back to the earliest days of photography, can there ever be real and true proof of the paranormal? While every image might seem easy to explain away, sometimes there comes a photo or two that can’t be so easily dismissed. Below are fifteen paranormal photos and the chilling stories behind them that are sure to give you the shivers. Perhaps, after all we have a good reason to be scared of the dark and all the dwells within it. They say seeing is believing but the final judgement is for you to make. Be sure to share your thoughts in the comments area below. 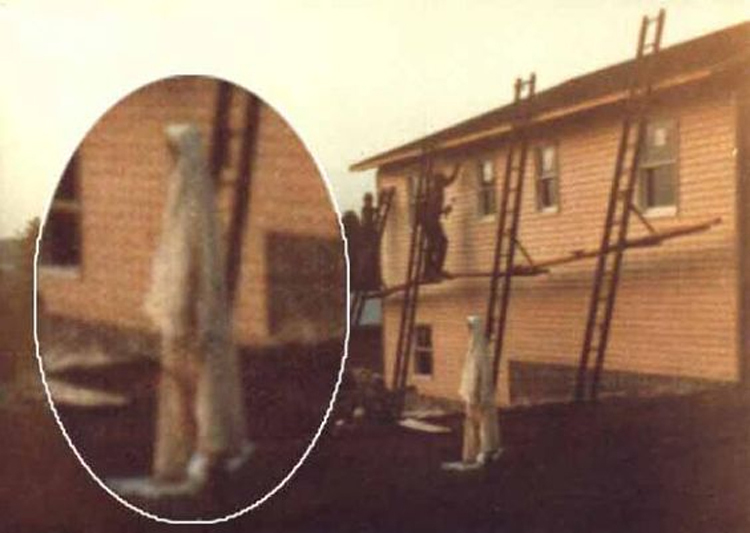 Taken in 1977 in Kramer, Pennsylvania, the picture appears to have captured a strange costumed woman in white as she slowly walks by the house. The photographer was surprised to see this figure on film as no one other than the workmen pictured had been present at the time the photograph was taken. In 2009 Patrick Heil snapped this picture of his backyard. 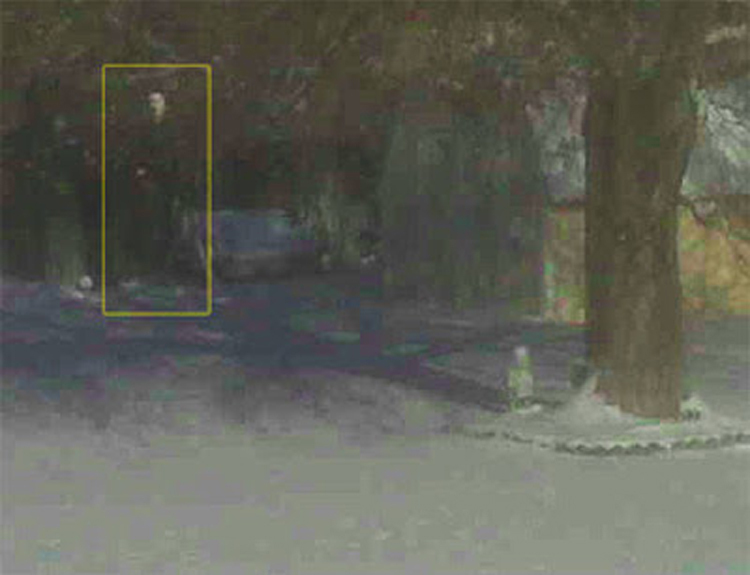 In the upper-left hand corner appears to be a dark presence staring straight back at him. 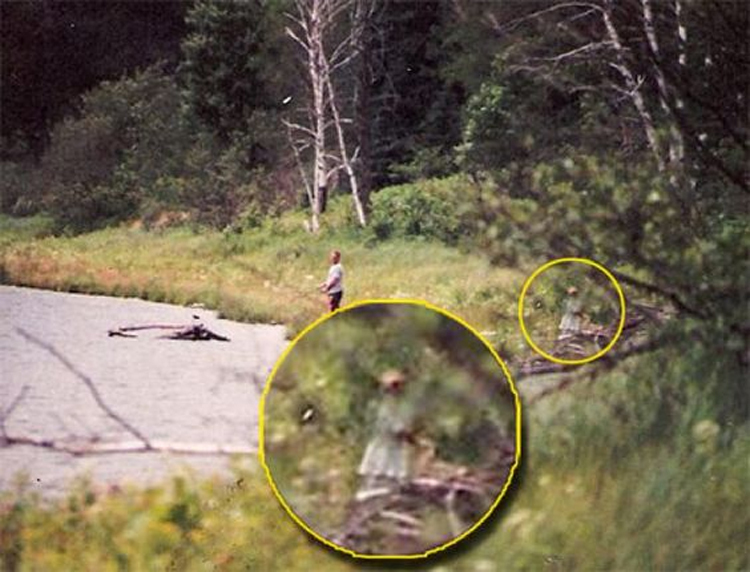 If this figure wasn’t creepy enough, Patrick claims there was no-one there at the time he took the picture. 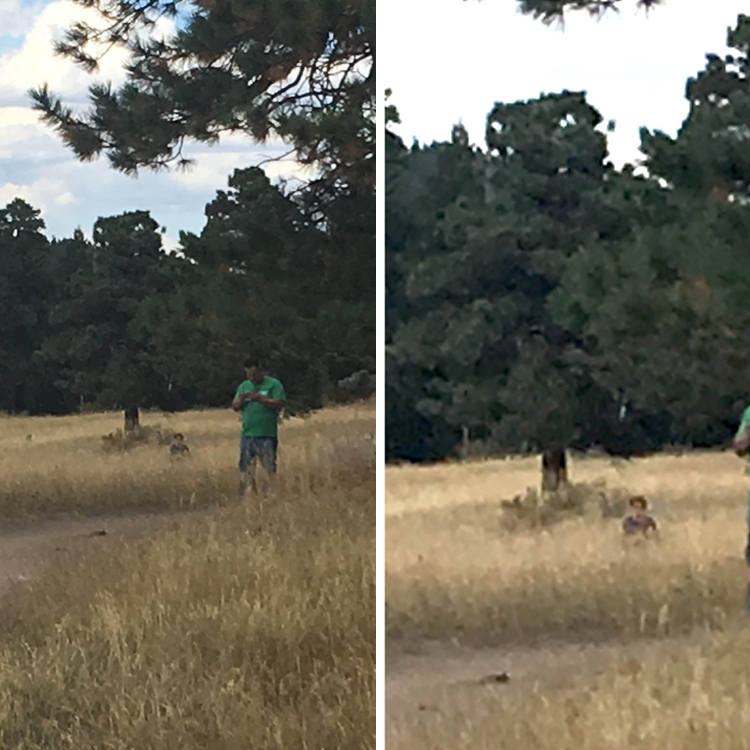 Uploaded to Reddit in 2016, the submitter explains this photo of his father was taken by his girlfriend in the Rocky Mountains, Colorado. Taken on an iPhone but zoomed in, he claims there was no one around at the time. His girlfriend also saw nothing when taking the photo. She didn’t realize the mysterious figure crouching in the grass was in the picture until they returned home. Elizabeth Tolomeo took this picture of her husband fishing on lake Dorothy Dunn, in northern Wisconsin in the early 1990s. It was only after developing the film sometime after the trip that Elizabeth spotted the apparition of a young girl, possibly wearing a pinafore and bonnet off to the right of her husband. She went on to explain the lake had once been part a busy logging area, when the plague hit many young children died. Is this the spirit of one of the lost children? Submitted by Judy Murphy, the photograph shows her son who lives in a remodelled Victorian home in Ocean Springs, Mississippi. You can clearly see the head and shoulders of someone standing directly behind the young man to the right. The second picture taken just seconds after the first this photo, nothing was there. 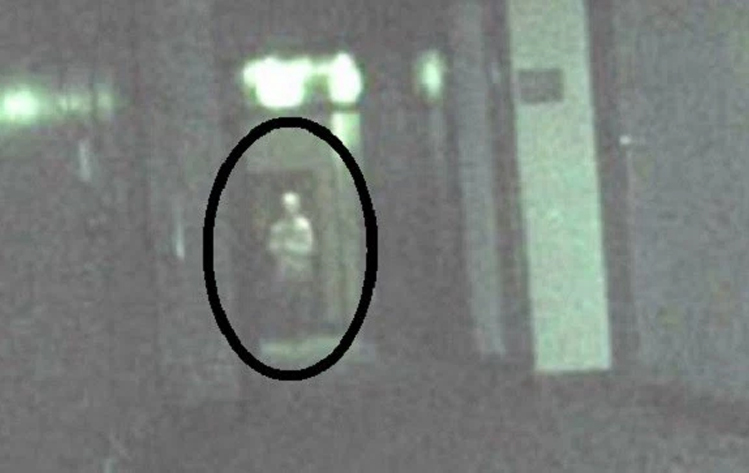 Taken at the old Fort Douglas Hospital in Salt Lake City, this photograph reportedly shows a spirit in a straitjacket. 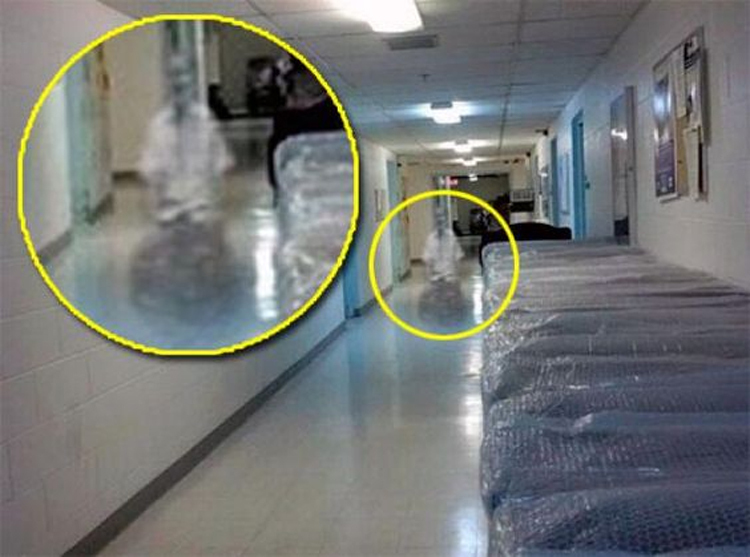 Investigators from Utah Ghost Investigation snapped the photo on the third floor which was once served as the hospital’s asylum. 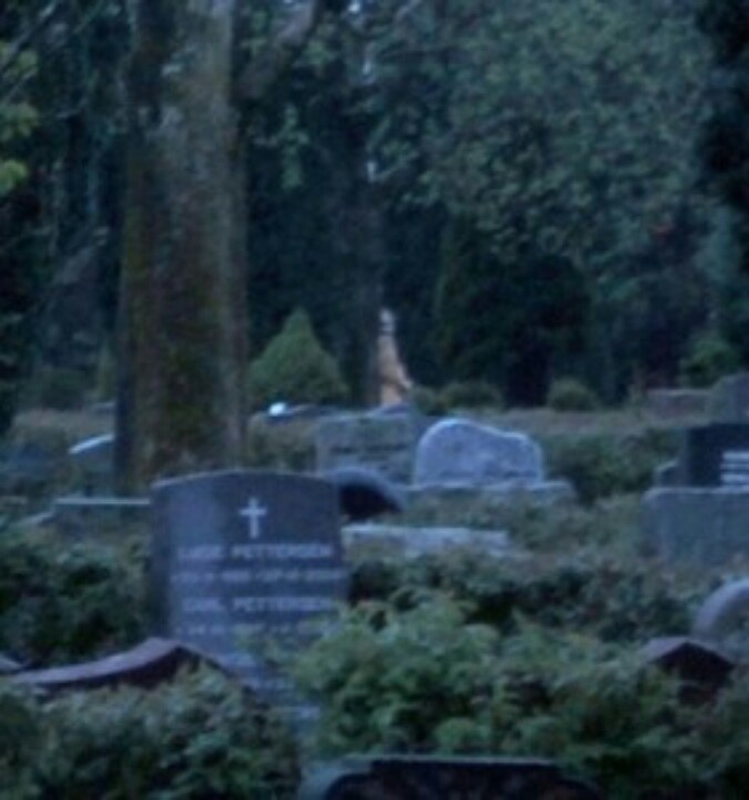 A couple practicing taking night photography in their local cemetery captured this sinister looking figure in one of their photos. It was only after reviewing the pictures later that night did they spot the apparition standing behind the tree in the background. 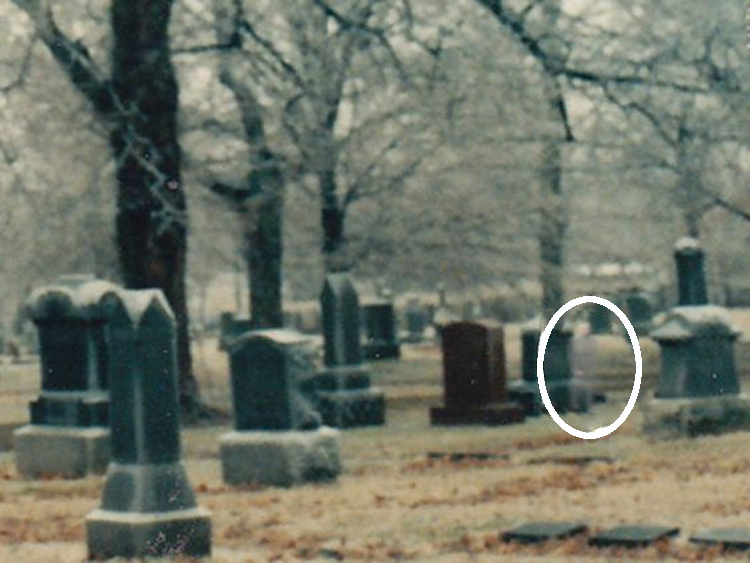 Is this a genuine paranormal entity or simply a person taking a late night stroll through their local cemetery? 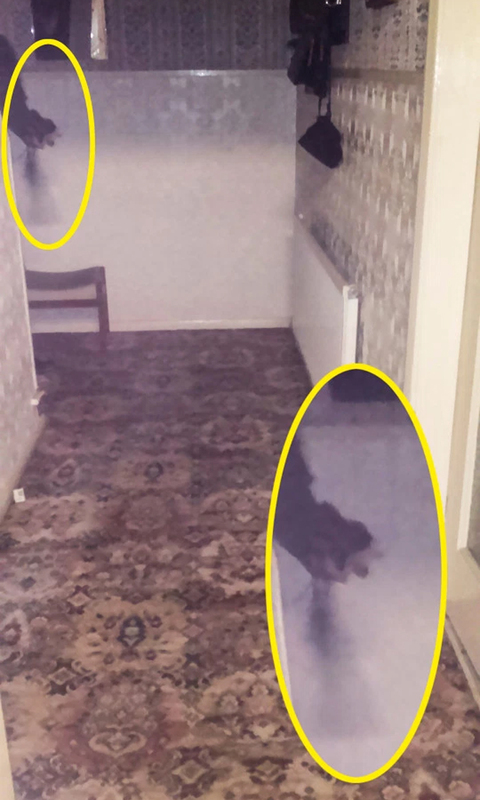 Claire Cowell took the chilling picture inside 30 East Drive in Pontefract, West Yorkshire – one of the UK’s most haunted homes. 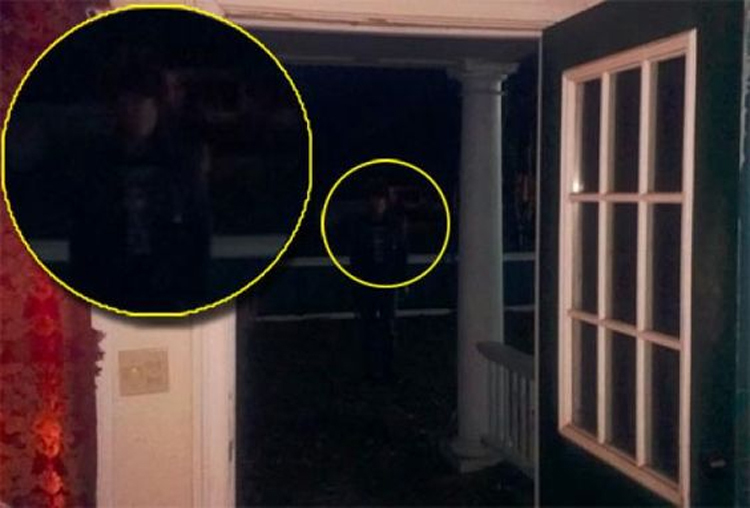 The paranormal investigator says the picture shows the arm of a ghostly figure in a monk’s robe clutching rosary beads, which she believes belongs to the violent poltergeist who terrorises the property’s inhabitants. 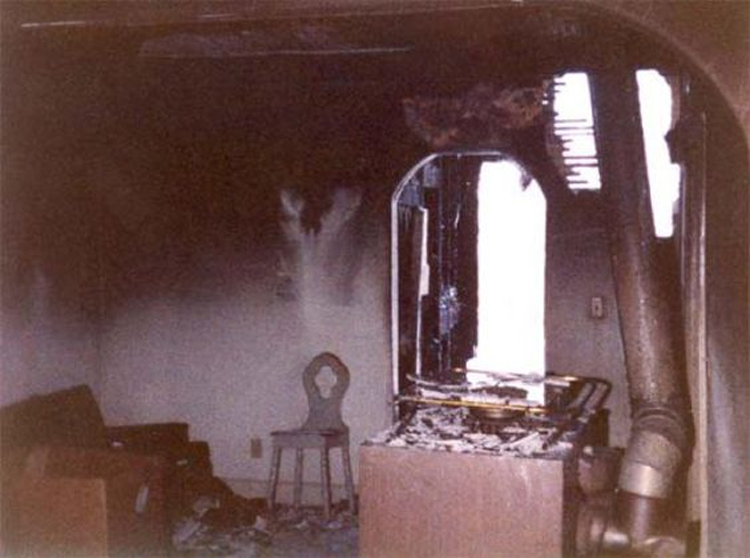 This picture taken by Mary Gebro of the living room of a notoriously haunted house in Wahpeton, N.D.. One night the home burned and Mary went in to take pictures of the damage, although she clearly captured much more when she saw this apparition in front of the picture on the wall. It was not there when she took the picture; she also reported there were no electric light’s on to provide the mysterious “shadows”. Hanna Butler from England snapped this creepy photograph during a ghost walk at Hessle Foreshore woods in East Riding, Yorkshire. Legend has it an orphaned girl haunts the woods, watching and waiting for her lost father. 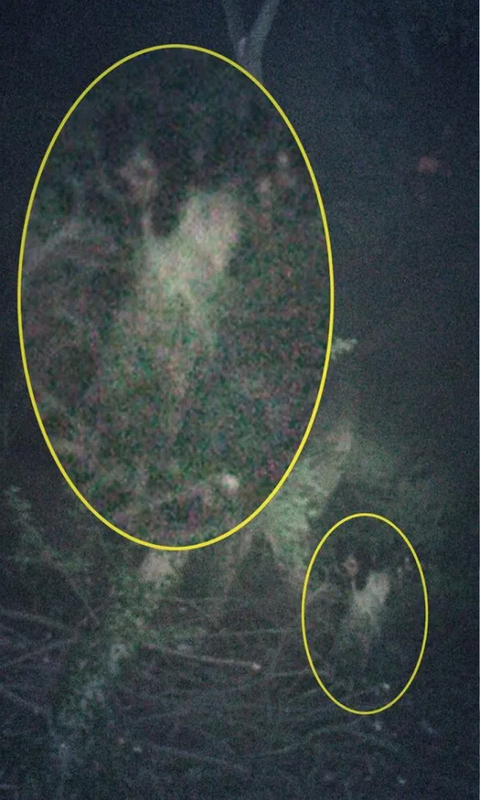 Similar ghosts have appeared throughout England, including one in Cannock Chase Woods in Staffordshire. 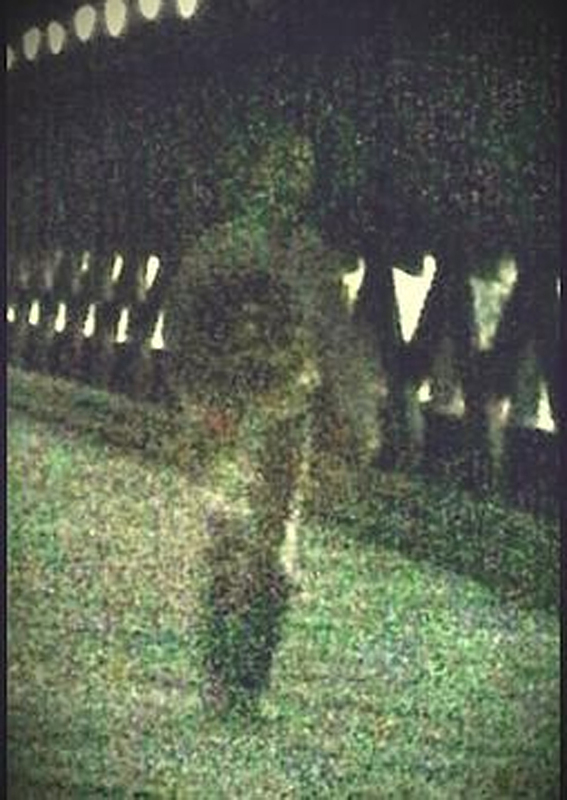 The paranormal team After Dark Investigations captured this stunning picture of shadow person walking along Sachs Bridge at Gettysburg during one of their most recent investigations. Gettysburg is famously known as one of the most haunted areas in America, with multiple sightings of spirits of fallen soldiers reported each year. Taken in the basement of Kith Haven Assisted Living in Flint, Michigan in November 2012 by an employee who said she saw the apparition with her eyes before grabbing a phone and taking this paranormal shot. If you look carefully you can see what appears to be a man in a white shirt, sitting in a wheel chair in the empty corridor. What makes most of these things unbelievable is, WHY would people be taking pictures of these areas?? WHO takes a photo of an empty hallway, etc?? ?